Another night with high expectations was turned into mild disappointment in the planning phase and then into unanimous approval and enthusiastic applause by sold out and packed Opera Bastille cheering main protagonists, conductor and director who was not there to receive gratitude from the public. The run of performances of Les Contes d’Hoffmann was highly in demand at season programming announcement since Jonas Kaufmann has planned his Hoffmann role debut there. Tickets flew off at record speed, and then, when Kaufmann announced cancellation in September, so many fans were disappointed that even Opera de Paris offered compensations for subscribers in a form of any other performance as a bonus. Nevertheless, the house was more than packed, at least on the 1st balcony there were numerous people waiting for the lights to dim in order to take seating on the alley steps. The story is well known, and explores romanticised quest for ideal love, and is built as mosaic which assembles into a new image and then disintegrates to create another one. It will never turn into ideal solid colour, each new image will be a combination of those small colourful pieces. Main protagonist Hoffmann is obsessed with an image of impossible love, his disappointment is unavoidable – and “she” has to disappear just to give chance for the next dream. Ramón Vargas has been chosen as the replacement for Kaufmann for the run and it took ONP to negotiate his schedule with the Metropolitan opera. As the evening proved, the choice was probably the best of currently available for the role. 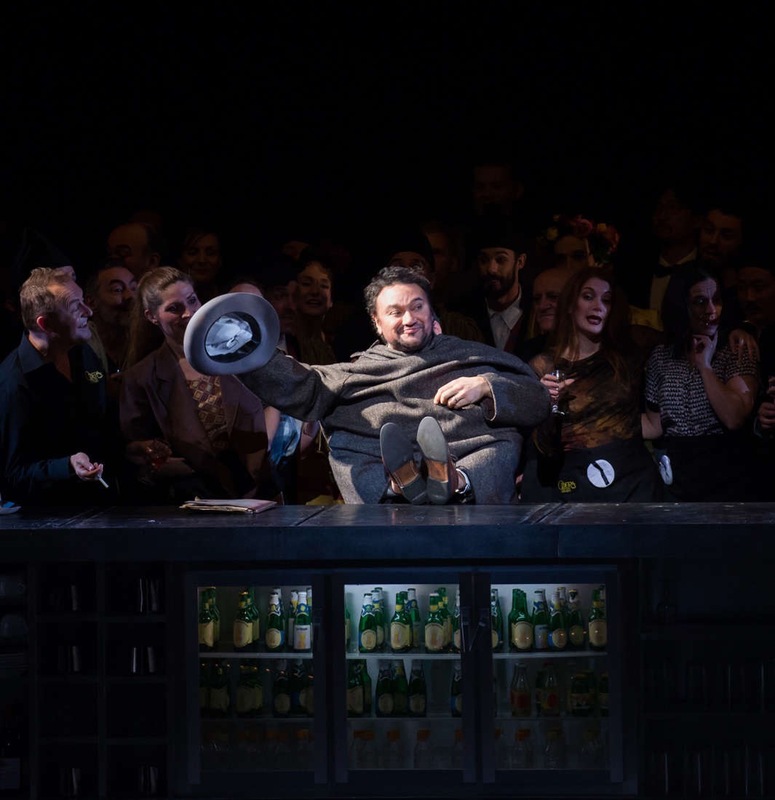 Vargas has pleasant timbre, he can effortlessly produce sound into the huge auditorium of the theatre, and has enviable acting talent, which kept audience tied in for the whole 5 acts of the opera. At some point in Act 2 with dying Antonia it felt like his energy has drained, and even if further performance was solid it lacked certain spark which was there during the first half of the evening. Vargas in one of the best-known stories of Kleinzach (“Il était une fois à la cour d’Eisenach“) delivered both vocally and dramatically compelling performance. Here and throughout the performance he was well supported by Nicklausse by Stéphanie d’Oustrac. Her transformation from La muse into Niclausse and back was admirable, especially her plasticity elaborated in boyish gait and gesturing besides fully believable exterior. her vocal performance was impeccable, voice strong and with admirable agility. Her acting throughout all acts of the opera was consistent and convincing and I have got another name on the list of upcoming artists to watch growing their talent. .The first in line of illusions was Nadine Koutcher as Olympia, who delivered admirable acting and singing, and made obvious the intent of director Robert Carsen to treat the classical story with a dose of healthy irony. 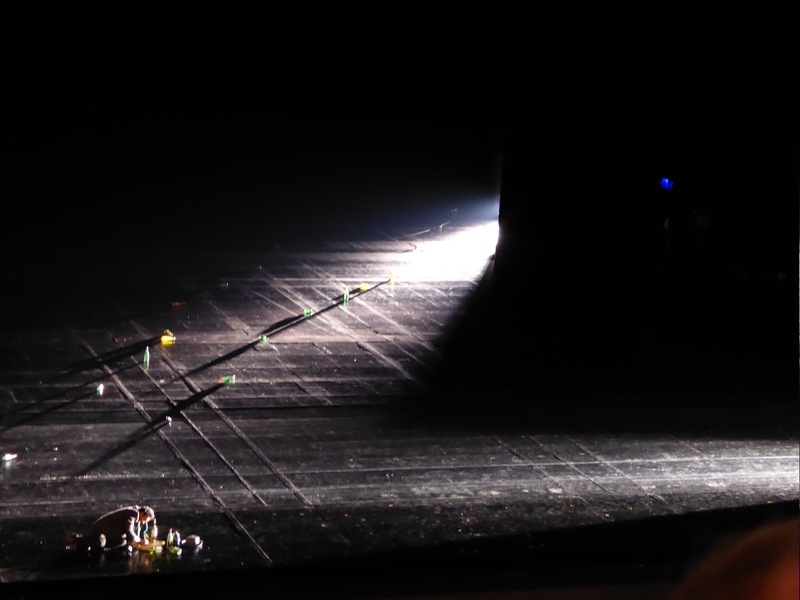 The concept revolves around theatrical stage, which is rotati g and turning in front of our eyes – either we are part of the backstage and see the ramp lights like extended extras, or being down in the pit, or at the proscenium watching the audience at the close up distance. Opening and closing scenes with theatre bar and intermission crowd being served just strengthens perception of presence and actual participation in this elaborated play. Colorfully dressed chorus with well rehearsed dancing number, a lot of funny acting on “engineering team” side, a bunch of frivolous jokes that made the audience smirk and chuckle – all of those were kept in tight control not to be overplayed. The vocal part of all participants in the scene was outstanding. The next and heart-wrenching one in line was supposed to be Antonia, sung by Ermonela Jaho. As one of tweeps mentioned a few days ago after the premiere – who can die more convincingly then Ermonela Jaho? She certainly made most of the audience to sob or sigh at the end of the act, and appearance of Doris Soffel as her ghost emphasised pain of the tragic loss of a young artist. The sets and concept were visually engaging – doubling orchestra pit and stage, this time in a front view with a beautiful bright moon and headless statue as a centrepiece. Jaho created a character of stong but ailing young, aspiring artist who has love and hopes abound but her fate is predetermined.. emotionally touching, sound performance of a mature artist. Giulietta comes next, and Kate Aldrich added some more touches of irony as prescribed by Robert Carsen. The openign of the scene with legendary Barcarolle, one of the most awaited for duets was accompanied by laughter and smiles as the rows of seats were brought alive with the first notes, joining the swing of chorus, audience and soloists. The effect was quite a dizzying one, and it felt like the Barcarolle has become twice shorter, since there were so many other things to watch on the stage like intense lust and playfullness demonstrated by the chorus. Aldrich looked stunning in the costume and jewels, and that might have been all the commotion of the act that did not permit to pay attention to her vocal performance. The role of various villains of the storybook requires special attention. Usually the role is performed by one artist in order to add more dramatic weight to development of the evil as a concept, and it was approach used by Carsen as well. The villain of the night in various shades of dark being either Lindorf, Coppélius, Dapertutto, or doctor Miracle was Roberto Tagliavini. He actually was succeeding in painting his character from greyish to black, achieving apotheosis towards the end of the story. His bass is warm and deep, and even his top notes carry smoky coloring of the timbre. Roberto Tagliavini is another name to remember, it would be interesting to hear him in verdian repertoire. At the end there was Stella – breathtakingly beautiful diva, but mute and wordless, and disappearing in the company of more interesting prospects in search of her fame and well being. That leaves Hoffmann in solitude again, till Muse comes and leads him towards the light and love for poetry.. The orchestra sounded well tuned and balanced, and Philippe Jordan received loud cheers and gratitude from the audience well deserved. The singers were well suported, the score was read with agility and tenderness. Special mention to the production team – already praised Robert Carsen on the concept that will be likeable by both conservative and modernistic opera goers, and main role here has been on the side of set design by Michael Levine. It was a trip worth coming to Paris, enjoyable, satisfying and valuable performance to be remembered regardless of being a revival of original staging of 2011.